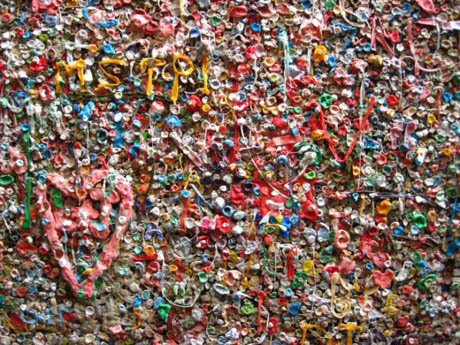 Despite persistent urban myths to the contrary, chewing gum is, technically speaking, edible. However, doctors do agree that it is not usually wise to swallow it, due to the risk of “gum-based gastrointestinal blockages.” Given that in 2005, Americans chewed, on average, 160-180 pieces or about 1.8 lbs of gum per person, per year, with relatively few swallowing incidents, the resulting post-masticatory waste probably adds up to more than 250,000 tons annually. Inevitably, disposing of this sticky mass poses some challenges. IMAGE: Seattle’s “gum wall,” one of the city’s “top attractions,” via. Most consumers dispose of their chewing gum responsibly. However, where chewing gum is dropped onto pavements it sticks firmly to the surface as it dries. Chewing gum does not break down over time and so the deposits gradually accumulate. 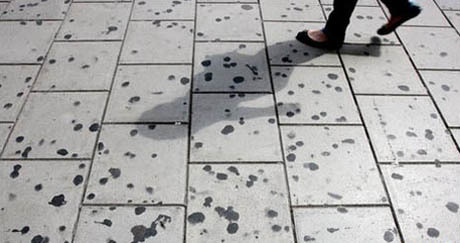 Pounded smooth by pedestrians, discarded chewing gum debris thus forms the dominant decoration of the urban floor, a soot-black snot speckled across asphalt or paving stones’ shades of grey. 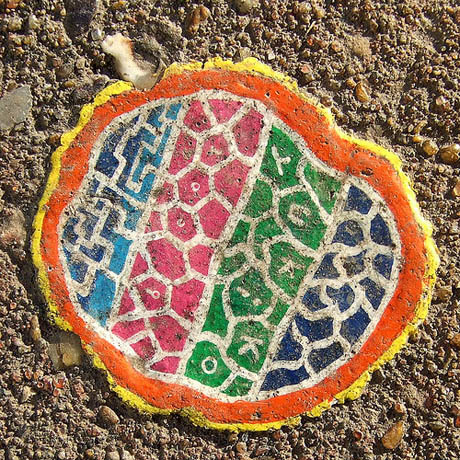 Writing in The Guardian in 2005, journalist Tim Adams reported that an incredible ninety-two percent of Britain’s urban paving stones have gum stuck to them. IMAGE: London’s splotchy streets, via the BBC. IMAGE: An area of heavy concentration in New York, via. 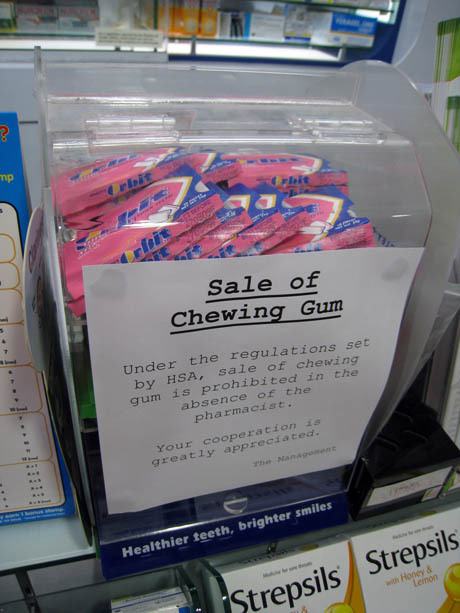 IMAGE: “Medicinal” chewing gum on sale in a Singapore pharmacy, via LoLo Eatable. However, the experiment was terminated in 2002, after just ten years, when intense lobbying pressure by Wrigley’s forced Singapore to allow the sale of “medicinal” gum as a pre-condition to signing a free trade agreement with the United States. 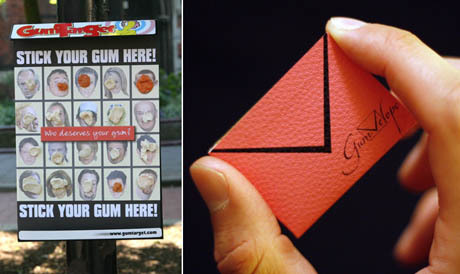 That same year, in the United Kingdom, where gum litter and hoodie-wearing are treated as serious social nuisances and tackled with a Bratton-esque “broken windows” fervour, Defra (the Department for Environment, Food, and Rural Affairs) proposed a voluntary scheme to restrict the sale of chewing gum in areas with particularly heavy deposition — a half-hearted attempt that was quickly shot down by gum manufacturers and local authorities alike. IMAGE: Gum targets attached to lamp-posts and disposable GumVelopes are just two of millions of designs that attempt to solve the gum litter problem through prevention. The key to successful gum-wardening, Nick explains, is not to walk purposefully, but to amble. In this way, they cover maybe eight miles a day. However, in the six weeks that they have been patrolling the city’s pedestrianised shopping area, with the back-up of 24-hour CCTV, so far Nick and Trevor have seen one man in the act of dropping gum. They threatened him with a £50 fine, though, in the end, they could not make the fine stick because it was not clear whether ‘the target’ had dropped his gum on public or private property. 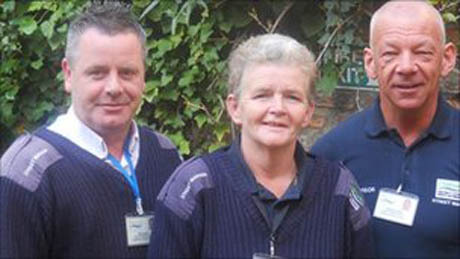 IMAGE: The gum-warden team policing the streets of Oxfordshire, via the BBC. In accordance with the unfortunate truth that it is easier to surmount almost any technological challenge than to change human behaviour or interfere with corporate profits, the holy grail of gum litter prevention is the development of non-sticky or biodegradable gum. 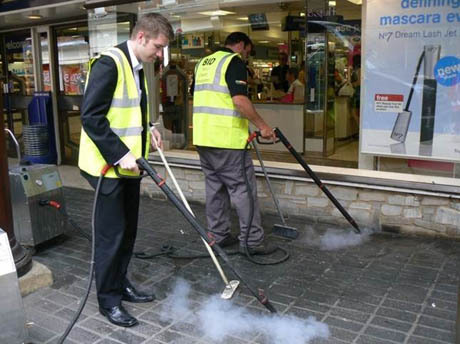 IMAGE: Gum removal in Winchester, via. While we wait for its biodegradable cousin to take off, removal remains the only 100 percent effective option for those who find Johnson’s “monstrous plague of chewing gum blotches” sufficiently revolting to justify spending between £0.45 and £1.50 per square metre to steam, spray, dissolve, or scrape the urban skin clean. In 2005, Defra estimated that local authorities spent a total of £150 million per year on gum removal, or three times more per gum blotch than each stick or piece cost when fresh. London spends £8,500 a pop to de-gum Trafalgar Square alone. IMAGE: Ben Wilson at work in Muswell Hill, via Flickr user nevilley. 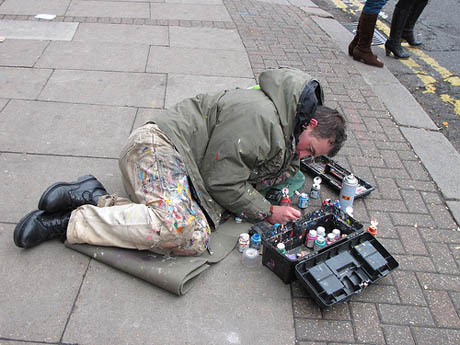 IMAGE: Ben Wilson painting a chewing gum blotch, via Flickr user Jansos. 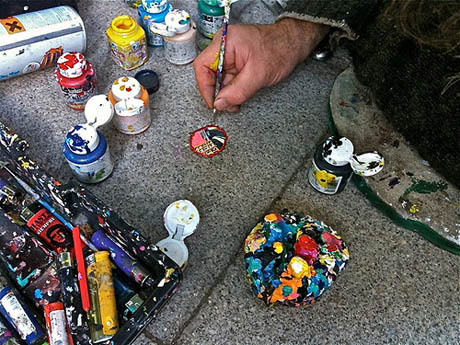 He developed a technique in which he softens the gum with a blowtorch, sprays it with lacquer and then applies three coats of acrylic enamel. He uses tiny brushes, quick-drying his work with a lighter as he goes along, and then seals it with clear lacquer. Each painting takes between a few hours and a few days, and can last several years if the conditions are right. 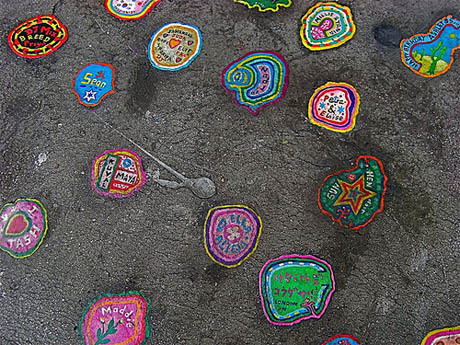 IMAGE: Ben Wilson’s chewing gum art, via Flickr user Grahamc99. IMAGE: A collection of Ben Wilson’s works, via Flickr user Judepics. To mark the closing of a Woolworth’s a couple of years ago, Mr. Wilson crowded every employee’s name onto a piece of gum, along with a good-luck message from the managers. He painted another in which the employees thanked their customers. The two pictures are still there, even though the store is gone. 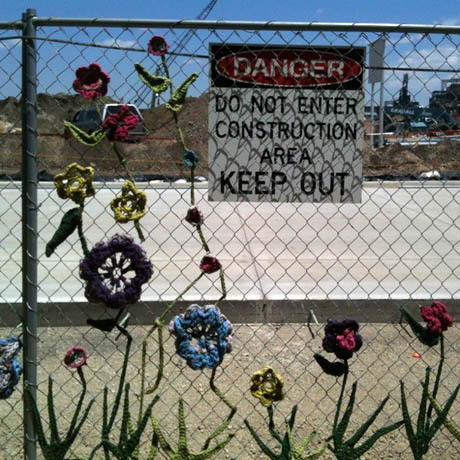 IMAGE: Yarn-bombing in Denver, spotted last weekend on my way to the MCA to judge cocktails. IMAGE: My first sighting of yarn-bombing, on 14th Street between 2nd and 3rd, New York City, in autumn 2009. The only imagery that children see around them are billboards and TV; every part of their environment is out of bounds or sold off. That’s why they don’t care about their streets. This is a small way of connecting people. IMAGE: A Ben Wilson streetscape on the street, via Flickr user Salimfadhley. The appropriation of chewing gum litter in the creation of a distributed artwork that provides local colour, pride, and even memory is, in my opinion, the highest end to which a stick of Wrigley’s could ever aspire. 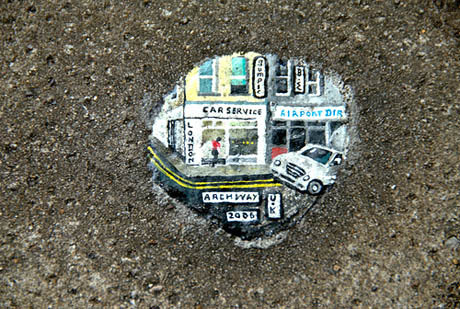 After all, Ben Wilson’s paintings not only compel us to actually notice the reality of our gum-strewn streetscape, inviting us, like Primo Levi, to mine it for reflections on our culture’s habits and choices, they also inspire us to reconsider every aspect of the urban environment as an opportunity to add unexpected beauty. 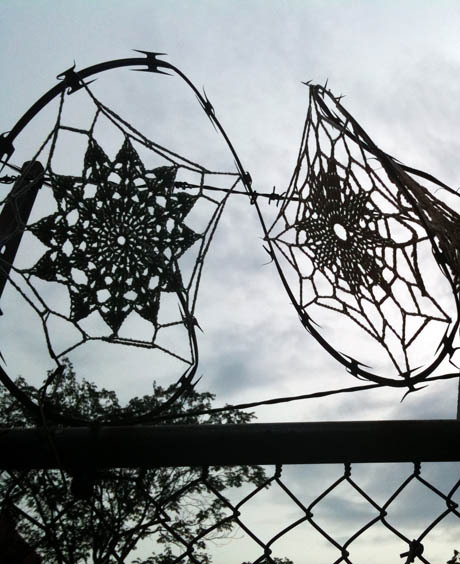 What other overlooked possibilities do the otherwise unloved chain-link fences, steam stacks, and Jersey barriers of the modern metropolis offer? How about high school students receiving community service hours for cleaning up gum? They will be much more aware of the mess that it makes, and hopefully will make better choices going forward. Why not spit your gum onto the road and contribute in a small way to filling pot holes and cracks. Tarmac is not aesthetically spoiled by gum in the way sidewalks are. I have never heard of anyone complaining about gum on roads, and there isnt a health hazard as you are unlikely to be loitering in the middle of a road for very long. Why not require gum companies to subsidize the clean-up? Else they should be simply banned. It should simply be banned, or cleaning properly enforced, the cost subsidized by the gum manufacturers and anyone caught littering. I painted one gum with Ben Wilson when he was visiting Belgrade. There is also guy from Serbia that collects in albums those spitted gums from the pavement, like botanist would collect plants. Interestingly, Crashsuit, it’s as big an issue in the U.S. cities that people actually walk in (e.g. 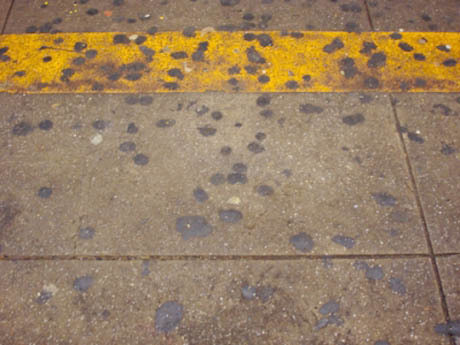 NYC); people chew as much if not more gum here, but they generally walk less, which means that less gum ends up on the pavement. Not so much an issue in the States. I wasn’t aware people chewed so much gum in some other countries. I don’t notice gum on the ground unless I’m stepping right in it on a hot summer sidewalk, and it’s then that I wish all gum-chewers had to walk through a mile-long strip of melted gum. I, too, can’t unsee the gum now! One interesting thing I noticed: the extra high volume right around the exit of drive-thrus, where people spit out their gum in order to start eating their food. There’s a special place in Hell for people who spit their gum out on the sidewalk. I’ve been living in Singapore for 6 months now where gum is banned, and I hate to agree with the nanny state here, but if people can’t do the right thing…. they have to be made to. No gum = no ugly gum on the pavement or under tables, etc. Littering is just another example of people living next to each other, but not together. Why don’t you swallow it OR keep that little bit of paper that each piece of gum comes wrapped in and wrap it in that and leave it in your pocket until you can find a rubbish bin? Pretty simple really! Anyone reading this will now start noticing all the black blobs everywhere just as I did after my attention was drawn to it. You’ll also be surprised how you’ll notice it on YOUTUBE videos of city pavements and roads. 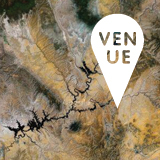 You might even be able to see it on STREETVIEW? Try zooming in on – Uxbridge Road, Southall, London! 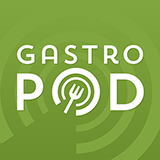 Fascinating round-up. while not a patch on Ben Wilson’s work, I was reminded of this piece, outside the famous Whitechapel Gallery in London, which I saw there a few years ago. Yesterday i was walking through St James Park with my father and he picked some lavender and rubbed it into his hands to remove the smell of cigarettes from his fingers.